Yoga Nidra: meaning, yogic sleep, balances the nervous system and reduces stress through a simple, guided relaxation while you rest in a nest of props (or perhaps in your bed at home!). Yoga Nidra’s can be of various lengths, with the typical offering at 30-minutes long. Most people fall in and out of sleep, but sometimes you will be awake and alert, or you fall fast asleep right away! Whatever happens is perfect and the beauty of this quiet and gentle practice: it’s about resting and restoring. I myself do these regularly; sometimes when I need a little pick me up, or when I’m processing through some stuff and just can’t quite get to the root of the issue, or when I didn’t get enough sleep the night before and I have committments that I need to be fully present for because a 30-minute yoga nidra is equal to 2-hours of sleep! 1. purchase 1 or 2 or all 4 of the Yoga Nidra’s I wrote and recorded via iTunes or Amazon: here. Plus there’s an in-depth, 20-minute explanation of the when, where, why, and how of yoga nidra if you purchase the entire album. Enjoy the benefits of this healing tool at anytime, anywhere, as your schedule allows with these MP3s. 2. 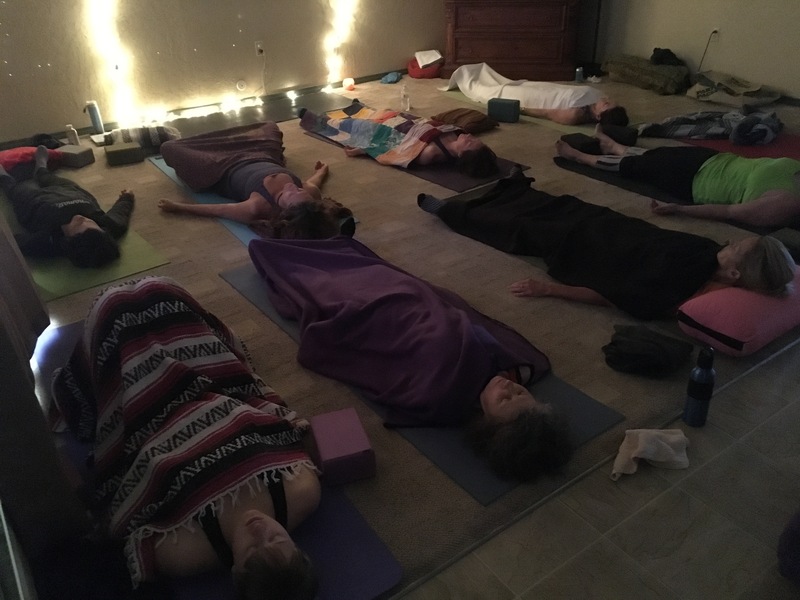 Attend my Yoga Nidra & Restore weekly group class and get the added benefit of Restorative Yoga: simple yoga postures held for long periods of time with the gentle assist of a lot of props. This class is a 1.25-hour practice that balances our fast paced lifestyles and has an enormous capacity to heal physical and mental symptoms. I hold these in Redding, but I also offer these when I travel, so be on the look out and join me when you can: here. 3. Attend my annual spring Yin/Yang Hot Springs Retreat. Here we find solace, healing, rest, and fun in my most favorite place in all the world: Surprise Valley Hot Springs Resort. Everyone gets their own private hot-tub filled with hot spring water from this valley floor, and we recharge and rebuild with vinyasa yoga, yin yoga, ecstatic dance, yoga nidra, restorative yoga, meditation, pranayama (breathing exercises), with time for reflection, massage, adventure, fishing, hiking, hanging out with new and old friends, and soaking to your heart’s content absorbing all the healing benefits of the mineral enriched waters. This is a gift of divine pleasure that has far reaching effects not only for you, but for those you love and want to serve well: you can only give away what you yourself possess. This is recharge, this is strength, this is delight in a weekend away. Find the full details when they become available here . Have you done Yoga Nidra before? Has it been beneficial for you? Let me know, in person, or below!